That is the question investors are grappling with just as Q1 earnings season – the best since 2011 with its 18% Y/Y expected EPS growth – enters its busiest week yet. 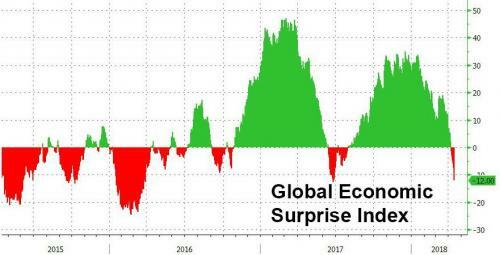 Meanwhile, as discussed here extensively in recent weeks, over the past two months economic data from around the globe, but especially Europe and the US, has come in unexpectedly soft resulting in the first negative print in Citi’s Global Eco Surprise Index, and now the most negative since early 2016. And, more notably, an inversion in the forward OIS curve – the first in 13 years – which as JPMorgan noted was the clearest confirmation that the US economy is very “late cycle”, and that a conventional yield curve inversion (2s10s), a harbinger of recession, is not far behind. In other words, all else equal, the Fed should end its tightening cycle. Economic slowdown worries – and indicators – aside, another critical discussion taking place in parallel is whether the market can keep rising even as yields push higher; this has become especially topical as a result of recent speculation that inflation is rising even as growth is slowing, a warning flag that stagflation may be just around the corner. Are Advanced Economies Ready For Recovery, Really?